The names of 75 courageous women from 13 nations are etched into a beautiful memorial at RAF Tempsford, home of the Special Duties Squadrons during the Second World War. These are the female special agents who volunteered for active service behind enemy lines as couriers and wireless operators, running escape lines and leading partisan armies. All were brave, and all deeply committed to the Allied cause, but they had little else in common. 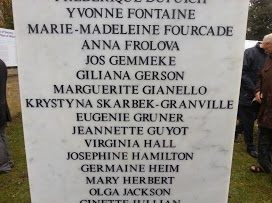 Although most were British or French, there were also women from the Soviet Union, Belgium, The Netherlands, Ireland, America, Switzerland, India, Australia and Chile, as well as two from Germany, sent in to support the domestic resistance, and two from Poland, including Krystyna Skarbek, aka Christine Granville, the subject of my last biography. Some were lucky, others not, many were beautiful which had its own pros and cons, some were plain, and one had a prosthetic leg. Most female agents were effective, at least for a short while, and Skarbek survived in active service for six years. The huge contribution of this diverse group of women came at a high price. 29 were arrested and 16 executed. One more chose suicide with her lethal ‘L’ pill. Today there is increasing interest in these women. Over the last few years there have been many new biographies and anthologies about them and several memorials. Tempsford is important in that it is the only one that pays tribute to all the women by name. Its marble column stands on a granite plinth collectively honouring the two special duties squadrons that flew them into enemy occupied Europe, but there is no reference to the male agents. Perhaps now we need to ask why is it that we still distinguish heroines from heroes. After all, the Special Operations Executive, better known as SOE, was in many ways a great gender leveller. Selected women and men went through the same training, including in the use of guns and explosives, and silent killing, and were armed and sent to work alongside each other in the field. It was, however, precisely because they were women, that these female agents were so valuable during the war. Unlike able-bodied men, civilian women travelling around France by train or bicycle attracted relatively little attention. This meant they were better-placed to serve as couriers between different resistance circuits or groups of Maquis hiding in the hills. Women transported messages, micro-film and radio codes, as well as heavy equipment such as weapons and wireless transmitters to arrange the delivery of agents and equipment, etc. Some of them, notably Pearl Witherington and Nancy Wake, went much further, commanding resistance armies of 2,000 men, and, among other achievements, Skarbek persuaded a German garrison on a strategic pass in the Alps to defect. 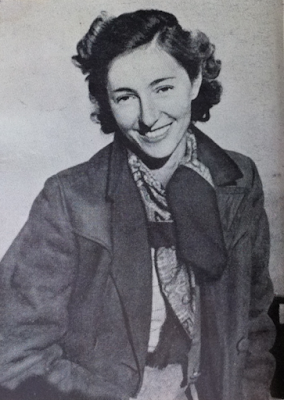 Skarbek, the first woman to work for Britain as a special agent, was employed in December 1939. Eighteen months would pass, during which time she served both across Eastern Europe and in the Middle East, before SOE was even officially established. The first female covert radio operator to be flown into France, Noor Inayat Khan, left England in June 1943. Even at this point, women in the British military were not officially allowed to carry guns or explosives. To circumvent this, SOE enrolled women into the FANYs, which officially operated outside of the Armed Forces but still theoretically offered some protection under the Geneva Convention in the event of capture, and provided pensions should the women become casualties. Churchill had approved the employment of women in SOE, but their role was not made public until some time after the war for fear of a backlash. Meanwhile the women who had survived found their achievements were underplayed and their skills undervalued. While Skarbek’s male colleagues were reassigned to roles overseas, after she turned down a series of secretarial jobs for which she was monumentally unsuited, Skarbek was dismissed as ‘not a very easy person to employ’. Meanwhile the official papers sent to her were accompanied by belittling notes such as ‘Hope you are being a good girl!’ Even the honours the women received were less than their male counterparts, as women did not qualify for British military awards. Many felt bitter about this, but none expressed it as succinctly as Pearl Witherington. After being awarded the MBE (Civil), she famously commented that ‘there was nothing civil’ about the work she had undertaken. It was only in the 1950s that the women’s stories began to be told. Having signed the official secrets act, many of the women, like the men they served with, refused to talk. Others, such as Odette Hallowes, spoke out, or like both Hallowes and Violette Szabo who had been executed at Ravensbrück, had their stories retold in biographies and films. And so the myth-making began. All too often, female agents and other women in the resistance have been honoured more for their courage and great sacrifice, than for their actual achievements. It has been judged more important that they tried, than that they succeeded. When the women did achieve, they still seem to have been feminised in the retelling, their beauty and sacrifices emphasised and their rough edges smoothed over. In order to be celebrated they have been, in effect, often recast as victims, rather than simply as heroes. Ironically perhaps, today we need to reconsider the female special agents not only because historically they were marginalised but because, all too often, when given attention they have been judged as women, rather than as individuals doing an extraordinary job. If you have been the business of special operations, it is clearly self-defeating to be elevated as a heroine if at the same time you are diminished as an independent agent. Such a great initiative that took place to admire the women effort during tough times. Wish people could acknowledge their work in routine life as well.